In The Avengers movie that opened this past weekend, Mark Ruffalo plays the Incredible Hulk, a creature born from a scientific experiment gone awry who joins a team of superheroes seeking to save the world. 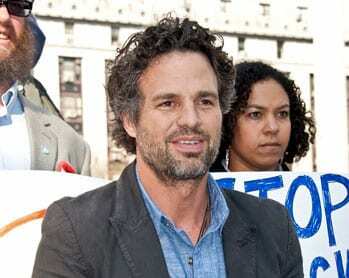 The risks of scientific progress and efforts to save the planet are also at play in his real-world battle against hydraulic fracturing, Ruffalo, a co-founder of the anti-fracking group Water Defense, tells City & State. City & State: How did you become involved in fracking activism? CS: Where did you go? MR: I went to Dimock, Pa. It wasn’t really to find anything wrong. It was just to see what was going on. But in a room of 40 people, it became clear to me that these people were under siege in their life, and the American dream was betrayed. What about the EPA? The EPA wouldn’t allow something like this to happen. Well, this isn’t regulated by the EPA, really. Well, what about the DEP? Well, they’ve pretty much turned their back on us. What about your attorney general? They’re not interested. There were victims there, and basically they were being told they were lying. You had these Americans who obviously had a problem, and everybody turned their backs on them. I didn’t want to get involved, honestly. But if I am who I say—I care about people and I care about injustice—then I realized this is coming to my community, where there are people that I love and I care for, and it can’t happen like this. CS: But fracking could create jobs in New York’s poorer regions. MR: There’s only a fraction of the jobs the industry says they’ll create. They tend to be incredibly transient. Cornell did a study last year on what the effects would be, especially in small communities that rely on pristine water and pristine air. A lot of these communities have only agriculture and tourism to support them. What happens is the community is left worse off after the bust. A few people end up making a lot of money. It doesn’t make its way out to the rest of the community. The workers leave. The area is left with less economic diversity. It kills off other industries. I understand that we’re in bad times. The other thing that’s interesting to point out is the fastest growing job sector right now in the United States, at 10–18 percent a year, is the green sector, or the renewable-energy sector. CS: In your experience, are people aware of the hydrofracking issue? MR: When I started three years ago, I just thought, There’s no way. We’re done for. We have the biggest industries in the world; we have Exxon Mobil and Chesapeake just dumping so much money. It was a done deal. Thousands of families have reported contamination now. These people are poor, they’re desperate. When their wells become contaminated, their properties become worthless. They turn to the gas industry, and the gas industry says, “We didn’t contaminate your well, but we will buy you out and give you water if you sign a nondisclosure agreement.” We will never know these people’s stories. You have people in Dimock, and some people in Wyoming now, these mothers whose children have come down with asthma and weird autoimmune-deficiency diseases, whose school is right next to compressor stations, and they’re getting together and they’re starting to get their stories out. They’re not taking the short money, which is what we’re seeing in Dimock. They’re saying, “No, we’re going to live through this, we’ve been wronged, and we’re going to get our stories out.” It’s very different now than it was even a year ago. Fracking is a national issue. There’s a lot of new information coming out, and the longer this goes on, the more we’re going to find out how damning it is. CS: What has been the most rewarding part of your activism on this issue to date? MR: I have to say what I wrote when this first started happening, in my local newspaper. The title of it was called “Thank God for Hydrofracking.” And people thought that was a crazy thing. What I saw was, and this came from my experiences in Pennsylvania, was that what we were seeing was the quality and character of a community. And we were going to be tested on what we were made of as a community. Were we willing to basically screw our neighbors to make a buck, knowing that there’s a good chance that their well water could be contaminated? The problem with the whole property-rights movement around this is that these people are drilling 5,000 feet out from their properties, so they’re drilling into every other property that abuts them for a mile. And now you’ve infringed on my property rights. When that gas and that methane is seeping out of those casings and ending up in my well, you’ve infringed on my property rights. So the community suffers. What I’m seeing is these incredibly brave people who are really Americans who are standing up for something that’s right, who aren’t selling themselves out for the short money, who have an idea that’s bigger than It’s just me against you, and I’m going to get mine and you can screw off. CS: Are there similarities between The Avengers and the fight against hydrofracking? MR: Superheroes have always been the guys that fight for the common good. That’s what I responded to as a kid. They always fought for the little guy. That’s what this fight is about. If the gas industry was just honest about what they do and how they do it, they wouldn’t have such a nightmare on their hands. I am beginning to feel like the only way they can make money is to do it the way they’re doing, to bypass regulations, to lie when contamination happens, to manipulate the markets. Now we’re seeing Aubrey McClendon and Chesapeake and the whole thing of them manipulating the markets, and lying to their investors. If they could do this safely and in a way that was aboveboard, then they would do it. So you have a malicious, malign force out there that’s doing damage and in some way needs to be stopped. And that’s the kind of thing that superheroes come to the rescue to. The superheroes today are my neighbors. CS: You play the Incredible Hulk, who was created by a freak accident during a bomb test. Does that kind of cautionary tale relate to hydrofracking and its repercussions? MR: There’s a long line of scientific experiments gone bad in history and in storytelling, and it’s something we go back to all the time. It’s all over the comic books. It’s in our consciousness and our subconscious as a culture. We personify it in our mythologies as superheroes and we live next to it in our lives, such as Fukushima and what’s happening at Dimock. This is a struggle that will continue to go on as we become more desperate for this type of carbon energy. Long gone are the days when we simply stick a straw in the ground and get beautiful concentrated carbon energy percolating to the surface with very little impact to the area around us. Now we’ve entered the era of extreme energy extraction: It’s hydrofracking, it’s deep-sea drilling, it’s mountaintop removal, it’s tar sands. These are the new norm, and they’re incredibly dangerous, incredibly toxic, and they’re accelerating global warming at an unprecedented rate. And that’s what we’re going to be stuck with. Just like the superhero disasters. CS: I know you’re in a hurry—and I really don’t want to make you angry and have you turn into the Hulk—but did you have a favorite superhero as a kid? MR: The Hulk. The TV show was my favorite, with Bill Bixby. I loved that show. CS: So it’s come full circle? MR: Yeah. I got lucky. In a lot of ways. In Japan, Twitter user Yumi Hareyama shared a photo of the dead sardines with a caption that read in part, "Try to clean the sea with everyone." Tons of dead sardines just washed ashore on a Japanese beach, creating a bloody, hellish landscape. Sadly it’s not unusual. 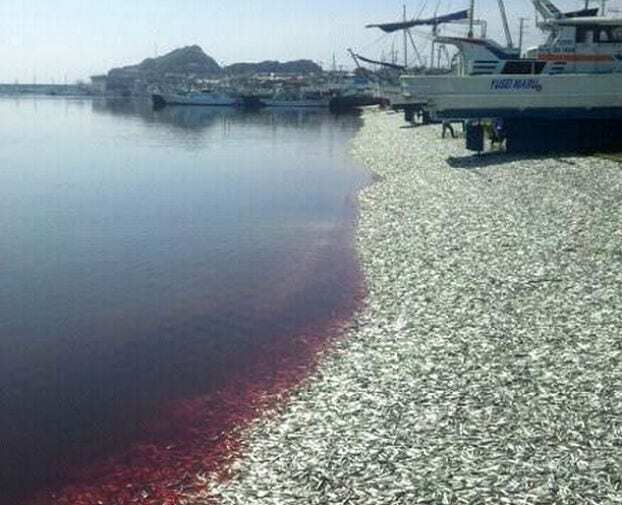 Starting June 3, massive amounts of dead sardines began clogging a fishing port called Ohara, located near Isumi City on the western side of Japan. A blogger named Kay for the Asian news site RocketNews24.com reported on Tuesday that the port was closed due to the emergency. Locals trucked tons of fish to landfills, according to the Daily Mail’s Leon Watson. No one knows exactly why this is happening, but other communities know the horror firsthand. In March 2011, millions of sardines suddenly died in King Harbor Marina in Redondo Beach, Calif. The cleanup cost more than $100,000 and required a crew of 200 workers frantically using a variety of methods to collect the silvery fish. At the time, the Los Angeles Times reported that scientists and wildlife officials believed windy conditions or possibly an oxygen-poor water column in the ocean caused the sardines to sweep into the harbor with a storm the day before. As a result, the oxygen levels in the area may have dipped too low and killed the fish. In May 2011, the largest fish-kill in Georgia’s history occurred in the Ogeechee River. More than 38,000 dead fish were found near an outfall pipe for King America Finishing, a textile processor, the Augusta Chronicle reported. The state’s environmental protection division said the fish died from a bacterial disease caused by environmental factors and it fined the company $1 million for discharging fire retardant through an unauthorized line. Other areas have experienced massive fish kills from algae blooms, red tides, toxins, changes in water temperature, and diseases. Commonly a lack of oxygen is at the root of the problem since fish need to absorb dissolved oxygen to live. PLEASE WATCH IN HD FULL SCREEN w/SOUND. It is a much better viewing experience. Hopefully you have a 1080P monitor and good connection. If not, bug a friend or colleague that does. It is worth it.